The pink, creamy or white flowers of the magnolia tree, native to North and South America, China and Southeast Asia, bloom during spring and summer. 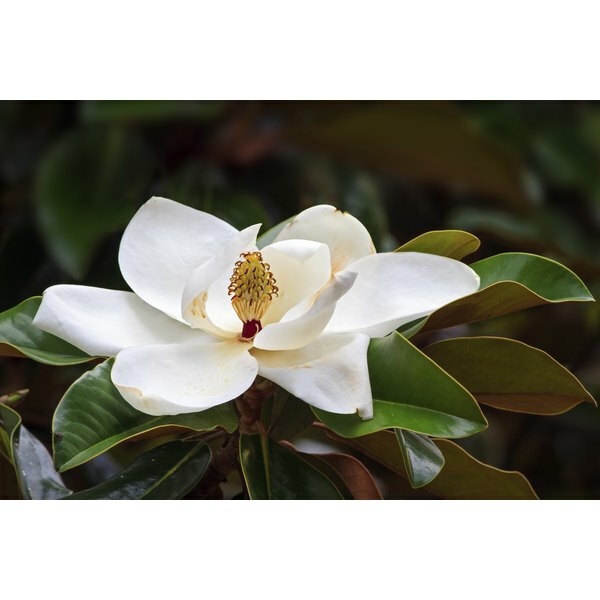 The extracts of the buds and flowers of the magnolia tree are available in decoction, alcohol extract, and volatile oil form and contain essential oils that may possess immense medicinal value. However, the side effects of these products have not been documented scientifically, so it is important to talk to a doctor before using magnolia flower products for their health benefits. The volatile oils of magnolia flowers can help prevent allergic conditions such as asthma by inhibiting the release of histamines from a type of immune cells known as mast cells, says Ikhlas A. Khan in the book “Leung’s Encyclopedia of Common Natural Ingredients.” Researchers of a study published in the June 2003 edition of the journal International Archives of Allergy and Immunology also state that the buds of Magnolia denudata, also known as flos magnoliae, can cause programmed death of the mast cells in the laboratory. However, clinical trials are lacking, so flos magnoliae extracts should not be used without consulting a doctor. “Leung’s Encyclopedia of Common Natural Ingredients” also states that extracts of magnolia flower have been used historically in China to minimize the irritation caused by some cosmetic ingredients. They can also help remove dark spots and whiten the skin. The products, however, have not been evaluated scientifically; consult a doctor before using them. The traditional Chinese medicine has been using Magnolia liliflora flower extracts for centuries to manage rhinitis or stuffy nose and the headaches associated with sinusitis, says Phyllis A. Balch in the book “Prescription for Nutritional Healing.” A study published in the August 2009 edition of the Chinese Journal of Integrated Traditional and Western Medicine has also revealed that flos magnoliae lilifora extracts can help significantly reduce the count of eosinophil cells in the blood and thereby, benefit children with allergic, stuffy nose. Always talk to a doctor before giving herbs to children. Another animal study published in the October 2008 edition of the International Journal of Molecular Medicine has revealed that flos magnoliae extracts can help prevent diabetes induced by the drug streptozotocin. Streptozotocin was originally extracted from the microorganism Streptomyces achromogenes, and was used as an antibiotic until it was found that it may be toxic to the pancreatic cells responsible for insulin production, and may lead to diabetes. These days, the drug is mainly used to treat the cancer of pancreatic cells.